Kernel Andorra Prolog is a framework for nondeterministic concurrent constraint logic programming languages. Many languages, such as Prolog, GHC, Parlog, and Atomic Herbrand, can be seen as instances of this framework, by adding specific constraint systems and constraint operations, and optionally by imposing further restrictions on the language and the control of the computation model. We systematically revisit the description in Haridi and Jarison [HJ90], adding the formal machinery which is necessary in order to completely formalize the control of the computation model. 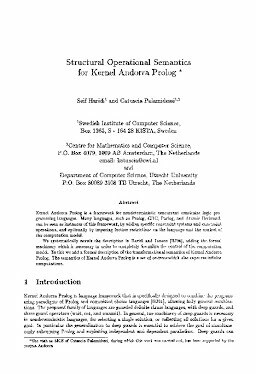 To this we add a formal description of the transformational semantics of Kernel Andorra Prolog. The semantics of Kernel Andorra Prolog is a set of or-trees which also captures infinite computations.